The third of the five volumes of Panchatantra. In a town called Mahilaropya, there was huge banyan tree which was home to all the crows in the locality. The king of the crows named Meghavarna set up strong fortifications to protect themselves. Likewise, the owls of the locality made a colony in a nearby cave. The owls had a strong and cunning army led by their king named Arimardana. Once a vast stretch of forest was ruled by a great elephant named Chaturdanta, but his subjects were not very happy. This is because there were no rains for several years and all the water-bodies like lakes, tanks, ponds were almost dry. All the subjects went to meet their king and appealed, "O mighty king, due to scarcity of water, many of our young ones are on the verge of extinction. Please look for a lake full of water to save us". In the same tree that I had made my home, a sparrow named Kapinjala lived in a hollow. We were good friends and used to spend our time discussing literature and episodes of our travels. One day, my Kapinjala left our tree in search of food with other sparrows and did not return even after nightfall. I obviously became worried, "What could have happened to him? Did he fall prey to a hunter? It is not normal for him to leave my company for such long time". In a small village there was a Brahmin named Mitra Sharma, who was a fire-worshipper. In the month of Magha (February), the sky filled with clouds and it started raining. 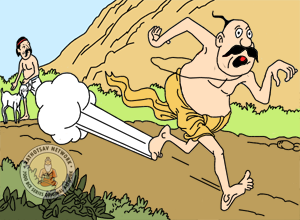 Sharma went to a neighbouring village to seek a sacrificial lamp from a rich man. He requested a well-to-do man in the village for a healthy lamb to be sacrificed to the Gods, which the wealthy man obliged. A Brahmin named Haridatta once used to live in a hamlet, and the land he used to cultivate did not produce enough for his survival. One particular day, unable to bear the summer heat, he thought of resting under a big tree in his land. But before he could spread, he observed a huge cobra swaying with his open hood in a nearby anthill. Once there lived an old widowed merchant in the south, who desired for another wife. He married a young daughter of another merchant by offering him lots of money. But the young wife did not love her husband. One night, when both the husband and wife were asleep on different sides of the bed, a thief entered their house. So shocked the wife became on the sight of the thief, that she embraced her old husband out of fear. Once in a small town there lived a poor Brahmin named Drona. He was so poor that he could not afford good clothes, or cosmetics, or even indulge in eating a paan (betel leaves). He looked weak in matted hair, unshaven beard and uncut nails - especially because he had no cover from cold, sun, rain or wind. A rich man felt pity on him and donated him with two calves. Once upon a time a king named Devasakti had a son who was growing weaker day by day. Experts tried to nurse him to health without any success because it was discovered that he had a snake in his stomach. The son felt dejected, and one night secretly left the palace. He found shelter in a lonely and deserted temple in another town ruled by a king named Bali. He would go out to beg for alms every day, and return to the temple at nightfall. Once there were three brothers, who were also sages named Ekata, Dwita and Trita chose a riverbank to do penance. Every day, they would dry their washed clothes under the sky without a clothesline so that they cannot drop and get soiled. Just like I (the kite) carried a female mouse, another kite was carrying a female frog, one day. There lived a bird named Sindhuka on a big tree in the lap of a mountain, whose droppings would turn into gold when they hit the ground. One day, a hunter observed Sindhuka's droppings turn into gold, while he was searching for a prey. There lived a lion named Kharanakara in a deep forest. One day, he was very hungry but found no animal after looking for a prey in every nook and corner of the forest. While wandering in search of food, he came across a big cave and thought, "This cave must be the home of some animal or the other, which will return to this cave before nightfall. I can have a good meal if I hide inside the cave and wait for the animal to return and pounce on him." In a forest on the Varuna hills, there once lived a black snake named Mandavishya. As he was becoming old, he was worried that he was no longer able to snare frogs, which will make him even weaker and eventually die. So, he embarked upon a plan and went to the edge of a lake and started pretending that he had lost all interest in worldly matters. Thus ends the third part of the Panchatantra.